Explore the château and have fun at the same time with the “Guideez” App (french version). Create and customize a virtual character that will accompany you during the visit, and follow the trail of King René! If you use a smartphone or a tablet, you can download for free the “Guideez au Château de Baugé” App for free from AppleStore, Google Play and Windows Store, at home or at the Château of Baugé ticket office. The “Guideez” App is specially designed for children over the age of 5, and allows them to become the tourist guide of their family! At the beginning, the child creates and customizes a virtual character, and starts the visit of the château, having fun while learning more about its story and the people who once lived there. At each stage, missions and mini-games – as Hunt and Seek, Spot the Difference, connecting dots or secret codes – attract their attention et give them access to adapted information according to their age. Objective: arousing their curiosity and teaching them how to observe the château even down to the last detail. 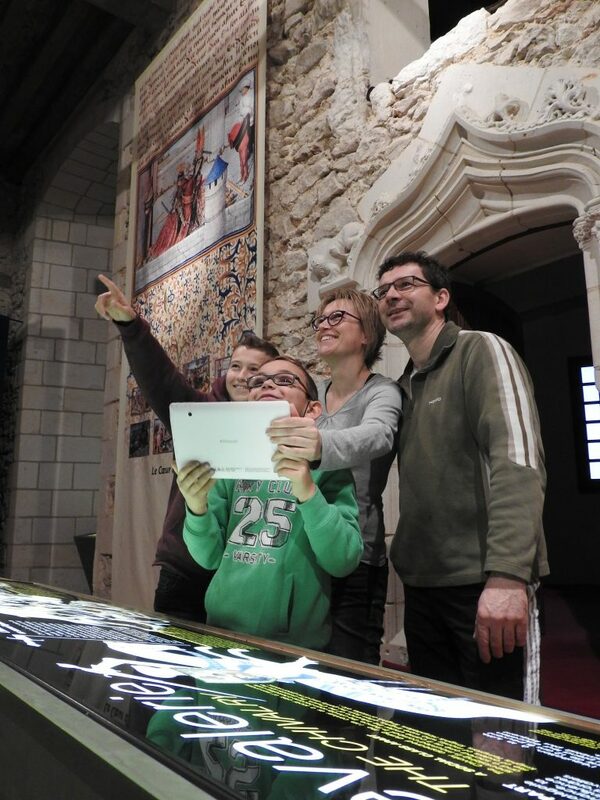 The architecture of the château, the court life, King René’s story, fox hunting or a knight’s outfit: at the end of the visit, children are unbeatable in their knowledge of the life at Baugé during the middle Ages, and are rewarded with a surprise. Back home, children can create their own customized travel diary on the website www.guideez.com. They find the photos they took with the App during their visit, their selfies, and the contents they read or wrote themselves. They have the possibility to comment them and to browse through them again, in order to recall even better what they have learnt. They also can turn their photos into postcards and send them to their family and their friends to share their adventure. A complete and nice experience for young and old !